With summer right around the corner Lick Mountain Excursions is operating full steam ahead. Presently we are taking reservations for weekends only. Be sure to make your reservations because we fill up quickly. If you need to join us during the week contact us and we will see if we can accommodate. We have several packages and if one of these does not fit your needs let us know and we will make a custom package for you or your group. Package 2- Extended stay- Afternoon package: Guided tour and then you will be dropped off at a designated area with a packed picnic lunch/dinner, and a radio. Let us know your wine preference and we will add a bottle from West Wind Winery to go along with the Cheese and Crackers component to your picnic package Vegetarian meals available upon request. Call when you are ready to return, or you may hike back if you prefer. Family package- children ride for $5.00 with a paying adult, max 5 passengers per trip. Come spend a romantic afternoon at the top of the world, with a glass of wine and your special someone! 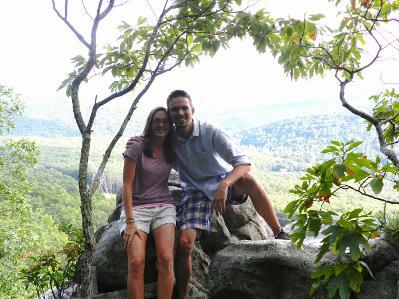 This romantic groom to be, popped the question on top of Buzzards Roost. Let us know if there is a special occasion or any special needs that we can help with.